This is a beautifully designed custom horsehair bracelet which will be created from YOUR own horse's tail hair ~ a perfect gift for you or your favorite equestrian! 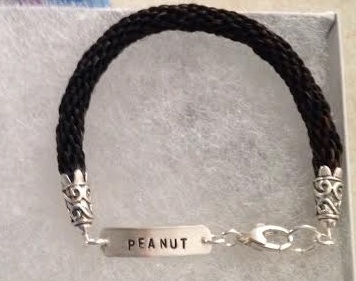 Create a lasting, wearable memento celebrating the bond between horse & rider. The solid sterling silver nameplate is 1.5" long & hand stamped so please limit it to 10 spaces for comfort. Being hand stamped without using a machine results in each piece having a unique and organic feel. The spacing is all done by hand and you may see some irregularities that give the piece a hand-made feel and not a commercially produced look. ~CLASP Heart or Oval lobster claw clasp. ~FONTS/Designs Choose from 5 font styles IF YOU TYPE THE NAME IN ALL UPPER CASE, IT WILL BE DONE IN ALL UPPER CASE. ~LENGTH Please enter the finished length you would like the bracelet to be . Add at least 1" to your actual wrist measurement. For this bracelet, we'll need about 16" of tail hair, in a ponytail about the size of your index finger. NOTE: If the hair you have is shorter, select the 2 braid/4 endcap option below. 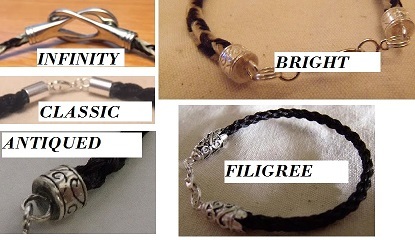 We will make your bracelet with 2 braids, joining them at the front with the nameplate and at the back with another set of endcaps and the clasp. After placing your order, you will receive an email explaining how and where to send your hair.